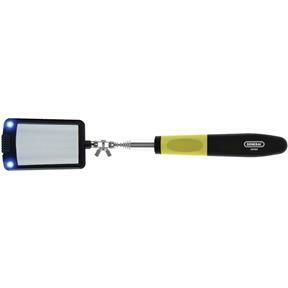 This Lighted Telescoping Inspection Mirror allows you to peer into the dark crevices of your work space in search of leaks, breaks or lost tools. The telescoping shaft extends from 12-1/4" all the way to 33", and the shatter-resistant mirror sits on a 36" degree swivel head for accurate positioning. 2 extra bright LED lights allows the inspection of hard to see and hard to reach areas, powered by 2 CF2032 batteries, included.